Those, who already experienced Ewin Stache live, know - or rather: don't know - what they can expect: something unexpectable, something crazy, but also something very fascinating. Erwin Stache is an eccentric designer, who unashamedly combines his child-like curiosity for experiences with his musical talent. 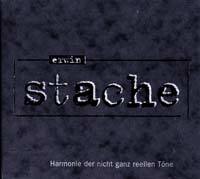 But also those, who "till now" have never heard of Erwin Stache, will be highly intrigued by the CD. The combination of the musical cover with a booklet that should not always be taken seriously, offers impressions rarely offered by a CD: impressions of wonder and recognition, astonishment and laughter, of curiosity. Erwin Stache was born in 1960 and grew up in Leipzig in the former GDR. He is musician and designer and constructor of sound- and musical objects. During his study of physics and mathematics he discovered the combination of music, technology and electronics. Yet, despite all their technical refinement, Stache's electronic machines, electro-acoustic and mechanical instruments as well as his music radiate an old-fashioned charm. Erwin Stache plays concerts for piano and selfmade instruments, does installations at unusual places, exhibits in galeries and cooperates in different projects also with other artists of different genres. For download: Netscape Windows users hold down 'shift' key, Mac users hold down 'alt' key.